Congress is pushing forward with an effort to spark a federal investigation into the Al Jazeera, the Qatari-funded propaganda network that recently conducted a secret, months-long spy operation on American Jews in Washington, D.C., according to lawmakers and sources familiar with the effort. 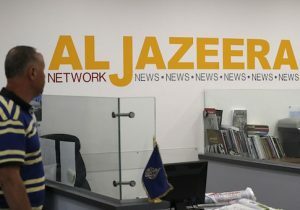 A bipartisan team of lawmakers including Sen. Ted Cruz (R., Texas) and leading House members such as Rep. Ron DeSantis (R., Fla.), a member of the House Foreign Affairs Committee, petitioned the Department of Justice to open an investigation into Al Jazeera to determine if it should have to register as a foreign-controlled agent under U.S. law. The Washington Free Beacon was first to report on this growing effort last month, when a bipartisan team of lawmakers and congressional officials began calling for an investigation after revelations Al Jazeera conducted a spy operation targeting American Jews on U.S. soil. The congressional call for an investigation appears to be the result of Al Jazeera's effort to secretly record American Jews and Israel supporters as part of a documentary purporting to show Jewish influence in politics, according to sources familiar with the letter, which was formally sent on Tuesday to Attorney General Jeff Sessions. As part of the upcoming documentary, a mole paid by Al Jazeera recorded pro-Israel advocates discussing efforts to combat anti-Semitism and boycotts of Israel. Cruz, who has criticized the Middle Eastern news outlet in the past, said Al Jazeera is publishing state-funded propaganda without regulation, similar to the Kremlin-controlled outlet RT, which was recently forced to register under the Foreign Agents Registration Act, or FARA. "The Department of Justice's recent designation of Russia's RT America as a foreign agent, as well as the questionable practices of Al Jazeera and China Central Television, strongly suggest the presence of a subversive threat in the United States," Cruz said in a statement provided to the Free Beacon. "Qatar's Al Jazeera, which the State Department has indicated is state-controlled, produces content that is anti-American, anti-Semitic, and anti-Israel, while promoting positive coverage of terrorist organizations such as Iranian-sponsored Hezbollah and Hamas." The Trump administration must take steps to rein in such foreign-funded propaganda outlets operating in the United States without restriction, Cruz said. The letter, signed by 19 lawmakers, demands the Justice Department provide Congress with detailed information about Al Jazeera's operations in the United States. "We find it troubling that the content produced by this network often directly undermines American interests with favorable coverage of U.S. State Department-designated Foreign Terrorist Organizations, including Hamas, Hezbollah, Palestinian Islamic Jihad, and Jabhat al-Nusra, al-Qaeda's branch in Syria," the letter states. "Furthermore, Al Jazeera's record of radical anti-American, anti-Semitic, and anti-Israel broadcasts warrants scrutiny from regulators to determine whether this network is in violation of U.S. law," it continues. "Such an investigation should cover the full range of activities undertaken by Al Jazeera in the United States, including reports that it infiltrated American 501(c)(3) and (c)(4) nonprofit organizations." In light of these efforts, the lawmakers request the DOJ "provide our offices with detailed information about the DOJ's investigative process, and whether additional entities, including Al Jazeera, meet the legal definition of ‘foreign principal' and if so, whether its subsidiaries should be required to register as ‘foreign agents' under FARA." Cruz's presence on the letter is particularly noteworthy in light of a campaign by the Qatari government to improve ties with the U.S. Jewish community. American political consultant Nick Muzin, a former Cruz aide, has been working on behalf of the Qatari government to organize meetings with prominent Jewish officials, a campaign that has been criticized due to Qatar's support for anti-Israel terror groups and recent spy operation.